Here’s a peek at the new Swims City Slippers ~ the best detail is definitely the maps of New York, Paris, and Tokyo on the soles ~ although i do wonder if it means with every step in dirt, you can leave maps for the lost? 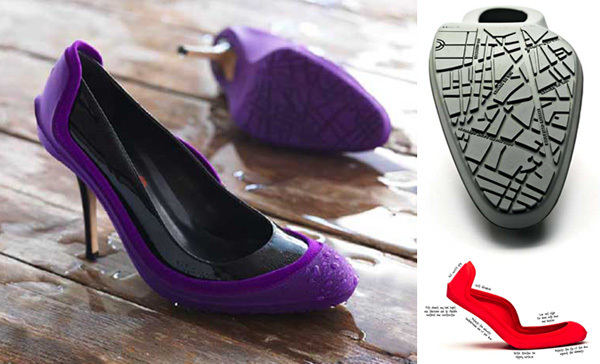 It’s flexible design is ready for heels of any thickness, and its low cut so no bows or buckles get caught. The price is $95, they will be available in burgundy, black, pearl, red, purple and olive. 3D & Radioactive Waste Treatment? Hmm..Yes we would all wonder?What’s story? Zeolites contribute to a cleaner, safer environment in a great number of ways. In fact nearly every application of zeolites has been driven by environmental concerns or plays a significant role in reducing toxic waste. This is a huge advantage to third world countries and other societies that suffer from unclean drinking water. A healthy supply of zeolites can reduce disease and illness. Zeolite offers superior performance for sand and carbon filters, giving purer water and higher output rates with less maintenance required. Zeolite’s highly porous structure captures particulate contamination down to 4 microns in size. This ensures that if you have a swimming pool, you’re relaxing and exercising in the cleanest possible solution for your health and enjoyment.